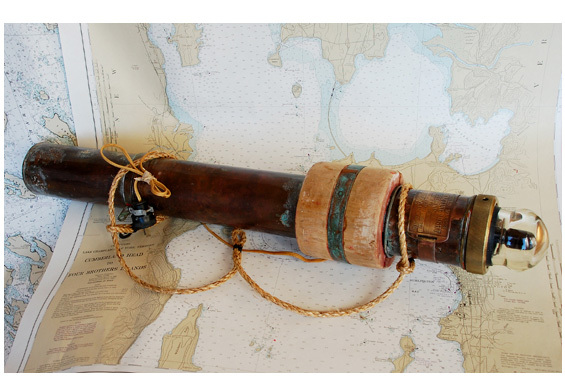 This vintage piece was purchased from an on-line auction (Fairbanks Alaska) described as an early emergency beacon that came from a Japanese Whaler. It was manufactured in Japan and is constructed of mostly copper and brass. Some where along the way someone electrified (120 volts) the red light... which works. Originally it was battery operated… stored on its side and when vertical in the water would illuminate. We cleaned this lightly/sealed with a clear lacquer. 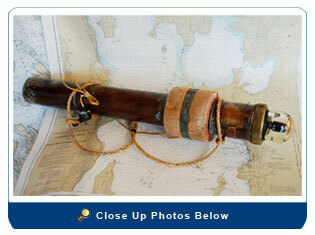 Size: 29 ½” long, cylinder has a 3 ½” diameter and the cork has 4 ½” diameter.